Run, Lift, Repeat: New York City Marathon: Running for Team for Kids! New York City Marathon: Running for Team for Kids! As I had mentioned earlier: I am going to be running the New York City Marathon this year. However, since by a glitch I should have qualified for guaranteed entry but didn't (my membership was not valid until March '12 but I did I think 12 + 1) I did not want to miss out and thought that this was a great opportunity to give back to the sport and a good cause. NYRR Team for Kids was decided on after looking into various charities and organizations that I could run for but thought that TFK was a good fit for me. Growing up while I was athletic I was overweight for the majority. It took me until 3 years back to really get a grasp on my health and that is when running took over. If I can help a child gain what I have through fitness and running at an early age, then this marathon has served it's purpose. So for those that may be interested please take a look at my TFK fundraising page! Every little bit of support is appreciated and helps tremendously! 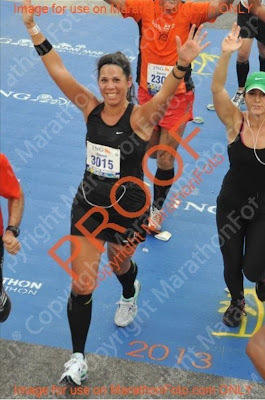 I can't wait to run NYCM and plan on this being my face for all 26.2!! !